We're opening up the entire online video library (over 24 hours of video) for free on March 11th for the Drupalcon sprint day. If you plan on participating in any of the sprints, this is a great opportunity to have a quick visual reference library at your fingertips. If you won't be at Drupalcon, you still have full access and can use the day to build some new skills. If you're currently a subscriber, one way you can help the sprinters is by compiling a list of the videos that have been most helpful to you and post it in your blogs or the BaM community support page. Then send me a link and I'll be sure to add a mention of it to a post that will go out sometime before the sprints. Quick tip: To get a link to a specific video, just right-click on its link on the home page and select "Copy link location". 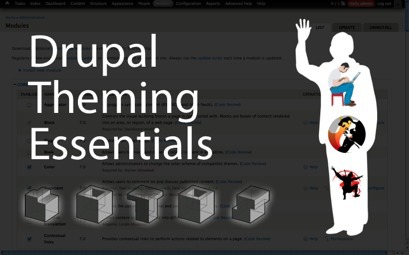 This week we released the first 5 videos in the new Drupal Theming Essentials series. In this series, we're going to give you all the tools that you need to modify the output of virtually anything in Drupal, from blocks to nodes to links. More importantly, we'll help you answer some common questions like "Where do I put this modification?" or "Do I use a module or a theme for this" or "How to I hide that pesky RSS icon". Conceptual groundwork to get a better idea of where coding and designing end and where theming starts. Over the last two weeks, Build a Module.com has released 17 videos on how to use the File API in Drupal 7. This week we wrap the series up with 7 more videos, completing the final example where we build an image gallery with managed files completely outside of the node system. We also added a video on X-sendfile, the Apache mod that makes the private file system scream, and we open up the black box of stream wrapper code. In addition to this release, the full collection of all 24 File API videos is also now available as a purchasable download. And below are the new videos. At this time, they're only available to subscribers, but we occasionally open up subscriber-only videos to the public for special occasions, so keep your ears out (or follow us on Twitter). Hot on the heels of our previous issuing of File API goodness comes 7 brand-spanking-new videos, starting with how to completely dominate unmanaged files, and wrapping up with tips on using and troubleshooting the private file system. This is good stuff! There will be one more set of videos coming out next week to round things out, where we cover working with managed files (files with a database entry) and toss in some useful bits about improving private file performance and demystifying stream wrappers. Last week's new videos on "Working with files and the File API"
Last Friday we released a set of new videos called "Working with Files and the File API." This group of videos demonstrates some of the basics of working with files, including how to set permissions on files and folders, the difference between managed and unmanaged files in Drupal, plus a few other important bits. We begin an example to demonstrate a cohesive module using most aspects of the File API to create a gallery-style image manager, but without any nodes. This send ends while we're working through the validation process on an unmanaged file form, and we'll continue this week and the next by building the same gallery system using managed files, and discussing a few additional topics like improving the performance of private files and diving into some stream wrapper code. Don't let the terminology fool you into thinking this is boring stuff. Knowing how to work with files can be an extremely powerful tool in your developer toolbelt, and when you get done watching this entire series, you'll be able to easily and intelligently know what to do when you have digital assets to gather, move around or protect. Below is a list of the new videos that were added, enjoy! The source code used in the current and upcoming File API videos has been added to the resource pack. Enjoy! High resolution retina Apple icon added to make Build a Module look like a real iPhone app! The only reason I know this is possible is because I checked out the Drupal watchdog table to see what kind of 404 page not founds and PHP errors I might be inflicting on unsuspecting viewers and discovered multiple requests for a file called apple-touch-icon.png. Sure enough, as I found out here, there's a Add to Home Screen option in Mobile Safari, and it looks for this image to use as the app icon. I first tried a 52x52px version, but it looked pretty grainy on my iPod Touch 4 retina display, so I created a 119x119px version and that's much more clean. Open up https://buildamodule.com in Mobile Safari. Touch the Add bookmark icon to open up the bookmark options. By default, the title is Learn Drupal, but you can change this to something like Become Awesome. That's it! 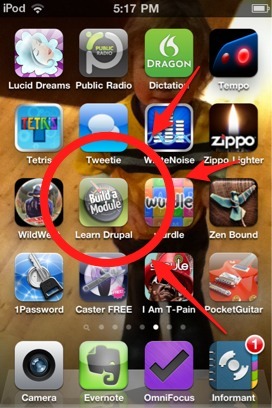 Now you have the official Build a Module faux iPhone app at your fingertips wherever you go. 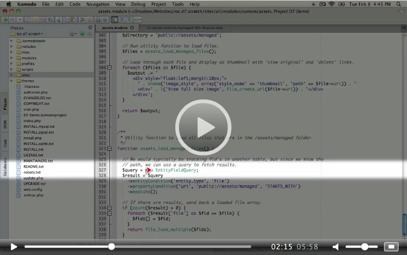 Want to learn Drupal 7 development, but haven't had the time yet? Have a development team that needs to get on board with Drupal 7 fast? Are you teaching Drupal and need training material for your students? The Build a Module.com site has been entirely revamped to include a super-clean interface for watching and browsing videos, new video organization, and a community forum for subscriber-to-subscriber support. There's over 5 hours of free videos available so you can learn a ton without having to purchase anything, though subscriptions, HD downloads as well as DVDs are available for full access to the videos. Once a purchase has been made, the entire source code for the examples used in the videos will be available for download so you can easily follow along. Learn how to build awesomely usable forms using the #state attribute to show and hide elements on demand. Ever wanted to change a Drupal form, but didn't know how? Look no further, here's how. Take a look behind the magic of autocomplete inputs - awesome for search boxes, usernames and more. How to build forms dynamically - add checkboxes, remove textareas, load new fieldsets, you name it. And all without a page reload. Slick! I bet you're at least a bit curious about render arrays. They're a big deal, like you! Learn how to use them to allow your pages to be modified by other modules. Tabs are nice, but what about tabs of tabs? Well, here you go. If you have any questions or have any material you'd like to see covered, please drop me a line. Drupal is rife with arrays, so knowing how to work with them effectively will open up some great possibilities for you. There's a lot you can do with arrays, but before you really dig in, here's a short article on how to find the contents of an array. Items in the tree that aren't contained in quotes usually indicate the type of variable. In this case, the top-most variable is an array, and the array contains other arrays, some strings and an 'int' (integer) value. The next line indicates a key / value pair by linking the key 'file_directory_path' with the value - also an array - through the '=>' symbol. You can see that the output is indented to indicate when one variable is actually inside another variable. If you look down the output, you can see that there is one more array embedded in the embedded array. Arrays like this are called 'nested arrays', and arrays can be nested like this indefinitely. That makes them ideal candidates for organizing hierarchical data. When you use var_dump() to output a array, you will likely need to view the source code in your browser to view the indentations. You can use var_dump() on any variable, and so it can also be very useful for getting the structure of an object. In future posts, we'll cover some techniques for manipulating an array. It quite the challenge to build a path to a file in the Drupal system without the help of the API. In particular, if you're building a module that needs to work regardless of where a site puts their files, you might end up lost in a rabbit hole of API functions that sound like they might do the trick, but don't. // file_check_location() checks whether the destination is inside the Drupal files directory. // check if the destination is instead inside the Drupal temporary files directory. // Not found, try again with prefixed directory path. The first line calls file_directory_path, which just grabs the value set on the admin/settings/file-system page of your site. Next, it runs through a series of checks to first insure that that the path hasn't already been appended with the file system directory, next to see if the file isn't stuck in the temporary file directory, and finally adds the system path to the file and returns the full path if the file exists. One thing to note is that once you have your full path, you shouldn't have to add anything else to use it. file_create_path should work on it's own to give you the file path you need. The difference between include and require is subtle. Require - as the function name indicates - requires that the included file exist to continue the script. So, if require fails, the script stops. Using include will allow the script to continue. Most of the time, using require makes more sense because it's likely that the file we want to include includes some important information for the rest of the script. First, the function assumes that we'll be using an include file that has the same name as the module. If not, no problem, we just set the name explicitly in the third parameter. Finally, the function checks to see if the file exists using is_file(). There is another function that operates similarly, called file_exists(), and the difference between the two is that file_exists will return TRUE if a file OR a directory exists with the name. If you know you're looking for a file, is_file usually makes more sense. There we go, a nice little function to save you some code repetition that also gives you some ideas for best practices on including files. In this post, you'll learn how to manipulate arrays in Drupal. If you haven't already taken a look at How to find the structure of a Drupal array, give it a quick look over before continuing. The important part here is that the $key is unique, otherwise the existing value for the key will be overwritten. Notice that we're having to change an array element that's within an array. We dig into the structure on an array using the  brackets. Because $form['name'] is an array, and we need to identify the #title element in that array, we use $form['name']['#title']. In Drupal, it's a convention to add a hash tag (#) to the beginning of variable names that correspond to a setting, rather than an element. This is done to avoid namespace collisions. There, now you're an array manipulation ninja. Go forth! Most of the time, 403 and 404 errors don't need to be dished out manually. Users will get a 404 when they hit a URL that doesn't correspond to an actual file or page, and will get a 403 when they are denied access through various access control utilities in Drupal. However, on occasion you'll need to explicitly send someone to a 404 or 403 error page, and in that case, drupal_not_found and drupal_access_denied are your friends. With them, you don't have to worry about manually settings headers or redirecting to the error page that's been defined in the error handling configuration. // If non-admin is trying to edit someone else's subscription, access denied. In this example, a little logic is need to determine if a user has access. First, it checks to make sure the user is logged in, then insures that if the user editing the subscription doesn't have a particular permission, they get booted with a drupal_access_denied(). Note that the drupal_access_denied function will only print the 403 page, but will not stop the script from continuing. So, you need to make sure that the functionality you're preventing access to doesn't get run by using a return after the call. The Masquerade module is checking to make sure that a user exists, before allowing access to a page specific to the user. If the user doesn't exist, then the page also doesn't exist, therefore the current user should get a 404. Notice that this snippet uses a slightly different syntax for the return. Instead of returning on a separate line, return is used on the function itself. drupal_not_found will not return any value, but the syntax still works and is slightly more elegant. This returns the correct value for me every time, with the query string stripped off. It is an absolute URL, which means that before we trim the slash off of it, $_SERVER["REDIRECT_URL"] would return /user. Good luck, and I hope you found this before totally blowing a fuse.